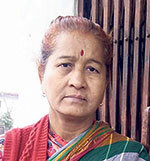 TIKAPUR, Jan 13: Born in a Badi family of Thapagaun, Salyan district, in the year 1965, Uma Devi Badi is often considered an epitome of struggle. In the recently held provincial elections, she got elected under the proportional representation category in Province 7 after filing her candidacy from Nepali Congress (NC). Her struggle for the rights of and opportunities to the Badi community had grabbed a lot of attention and appreciation. She was the commander of the 48 days long Badi movement which has left its mark in Nepali history. 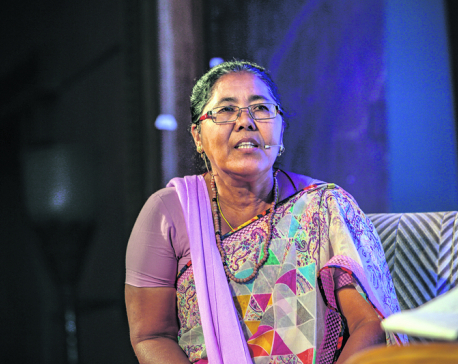 In 2007, around 500 Badi activists from 23 districts had started their journey from the villages to Singha Durbar putting forward a 26-point demand under the leadership of Uma Devi. Despite making numerous pledges and staging peaceful demonstrations, their voices were unheard. On August 22, 2007, Uma Devi led a procession from Maitighar to Singha Durbar. When they reached the gate of the government seat, security personnel closed the gates. Irked Uma Devi climbed up the gate semi-naked and started chanting slogans against the government. To her support, many other women took off half of their clothes and started protesting. That incident didn't just raise many eyebrows but also received applauds from various organizations. Interestingly, many had taken their movement as a protest of flood victims. "From ordinary people to ministers, all had thought we were actually flood victims," she said laughing. As the media started giving space to their issues, their movement started picking up pace. Girija Prasad Koirala, the then Prime Minister called Uma Devi along with other Badi women to Baluwatar and urged them to stop their protest. Koirala also assured them of providing shelter in Nepalgunj. But Uma Devi told him straight that Badis exist in all parts of the country not just in Nepalgunj. They later approached Sher Bahadur Deuba. But they were harshly treated by Deuba in the beginning. Later, he agreed to do something for them. Deuba called the then Peace Minister Ram Chandra Poudel and told him everything about them. Later, Poudel's personal assistant called Uma Devi and other women for a meeting. After the meeting held on September 10, 2007, the government decided to address the grievances of Badis. Badis has put forward the demand for permanent shelter, end of prostitution, untouchability, registration of birth and citizenship in the name of mother among others. To their delight, the government guaranteed in the constitution that a child can attain citizenship and birth certificate from her mother's documents. Five years ago, the government introduced a public residential program for the Badi community. Various skill development programs were organized to enhance the skills of Badi women. But Uma Devi feels that such programs have been ineffective. As she knows that still many Badi women are engaged in prostitution, which is regarded as their traditional profession. In 1998, a non-governmental organization named Community Service Committee (CSC) was formed under her leadership. This committee which works for the welfare of Badis estimates that there are around 60,000 Badis across the country. Uma Devi is currently handling the position of chairperson of the committee. She got married to Prem Bhatta at the age of 21. Their inter-caste marriage created a lot of stir and some even took efforts to spoil their relationship but didn't succeed. She doesn't have her own children because of which she raised two sons of her sister. Despite numerous rumors of her being fielded in the past elections, Uma Devi could not contest in any. Thanks to the constitutional provision which has ensured Dalit representation in parliament, she became the first choice for NC this time. After getting elected, her days have changed for good. The respect and appreciation that she is given now bring tears to her eyes.